It’s no secret that every student learns a little differently. Teachers and Educators have known this for years, but it’s only recently that schools have started taking a pro-active approach to curating their learning spaces to meet the diverse needs of all their students. Enter the living classroom – a concept based on the idea that learning styles change over time and that learning environments should be flexible enough to fit a diversity of learning strategies and students. 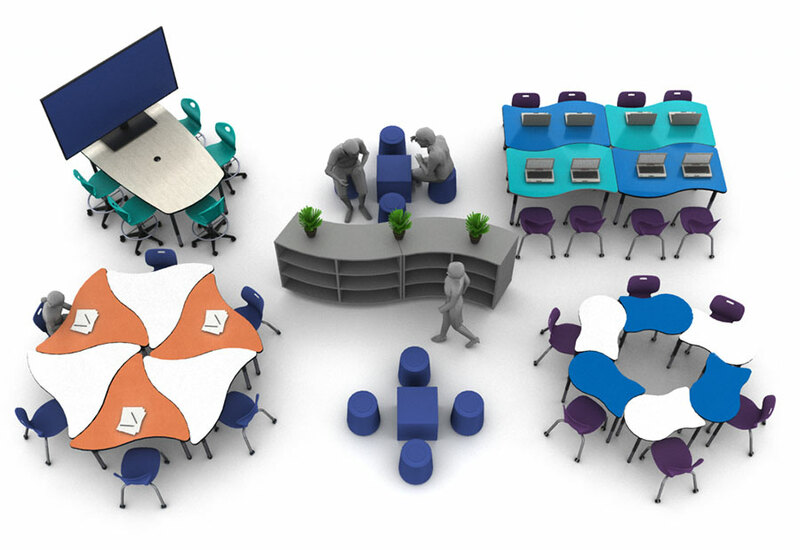 Simply put, the living classroom is the model educators can use to convert their 20th-century learning spaces to facilitate new and proven learning environment techniques. The living classroom is a concept born from the dynamic nature of learning. Technology, culture and student learning styles continuously evolve and develop every day. The living classroom theory is based on the idea that a classroom has multiple functions and the activities in the space keep changing based on the style of instruction and the participants. Transforming the classroom from the 19th century mechanical/ industrial age to the 21st-century organic living classroom age is an essential part of reinventing today’s learning strategies. The living classroom acknowledges that each student learns a little differently and provides room for all types of learning. A single desk or table is the right size for the individual study, partner projects, or for one-on-one tutoring sessions. When the team or project grows, desks and tables come together. There are many elements to consider as you plan a transition to active learning (or collaborative learning). Reviewing critical pieces like educational standards, curriculum, instructional activities, and testing is standard no matter what classroom you are using. However, it is also important to consider the classroom space. For example, how are desks arranged, where are the bulletin boards, and how are materials organized around the classroom? You can bring these seemingly disconnected components together in a system of six learning zones. 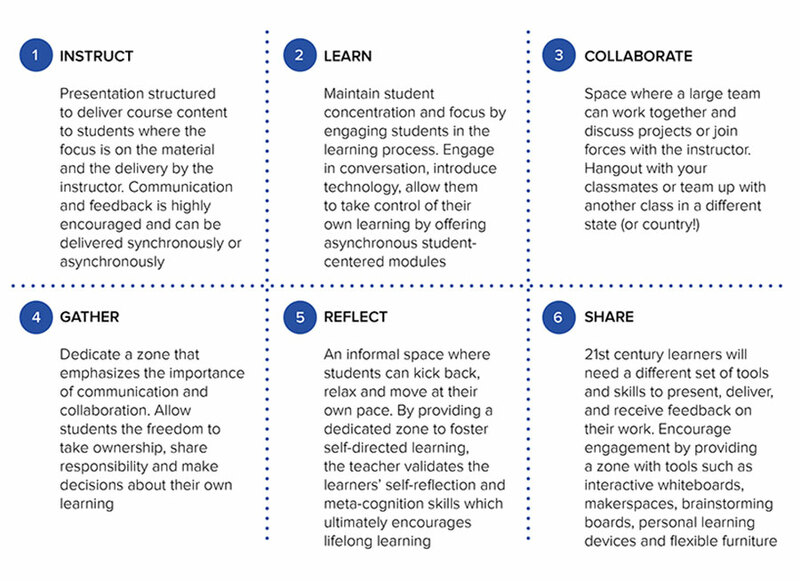 The instruct, learn, collaborate, gather, reflect and share zones will help establish routines, save time, and maintain organization from the first through the last days of school. This article addresses each of the living classroom learning zones to explore design strategies that facilitate better learning for your students. You can bookmark this page and check back regularly for ideas and shared stories on how classroom furniture and classroom design can change the dynamics of learning. The instruction zone serves as a little oasis away from home, but it also helps you manage your professional responsibilities. This zone serves as a private space to host one-on-one conferences with your students. The learning zone houses the worksheets, resources, games, and tech tools for the subjects you teach. It's crucial to display how subjects interconnect because too many students have a difficult time relating subject matter to other disciplines. Tools and resources should be moved from closets, storage bins, or cabinets and placed in this zone. Provide anchor charts with key ideas and strategies, flashcards, study notes, key people in the field, timelines, and a variety of print materials. Upgrade your word wall by adding visuals and real objects. Organize vocabulary alphabetically or by concept or story -- the key is to provide context for each term. Define the zone with a header and comfortable seating. A collaborative zone serves multiple purposes. It reminds students that everyone is working toward common goals. It provides time to discuss what was learned, make connections, pose questions, present other perspectives, and engage in reflection. These discussions are an opportunity for you to evaluate progress, clarify information, address misconceptions, and plan ahead. At the start of the year, you will lead the discussions, then transition toward having students open, facilitate, and close their meetings. It is helpful to define the zone and include the meeting time in your schedule. You can use an area rug to anchor the space and give several students a place to sit. Other students can remain standing or bring in their chairs. The gather zone houses all those items that spark imagination and bring a classroom to life. These include arts and crafts materials, recorders, cameras, music makers, games, puzzles, and fun books and magazines. Share samples of different projects so that students have a jumping off point. You can harness this creativity by giving the students a central concept to explore. Have them draw what they see, list observations, and write down their questions. Sharing the classroom space with 20 or more kids isn't always easy. Some students naturally prefer to work alone, while others only need a quiet zone to catch up on work, study, read, write, take a test, or reflect. Some lounge seating or a spare table and chairs in the corner of your room can be used to define the zone. If possible, provide some earphones to help filter out classroom noise. If needed, use study carrels to block visual distractions. 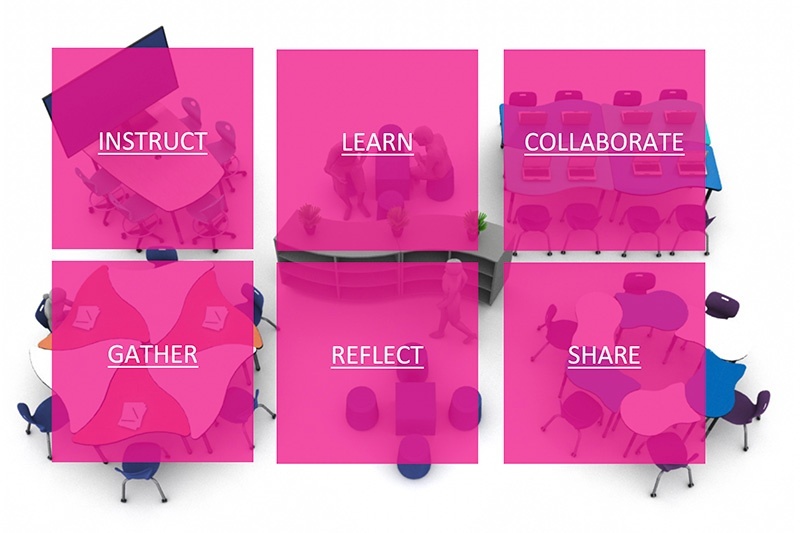 Every classroom needs a sharing zone and, like the collaborative zone, it serves multiple purposes. It helps students connect the dots from one lesson to the next and gives them a space to share what they heard, experienced, or learned that might differ from one student to the next. These discussions are an opportunity for you to evaluate progress, clarify information, address misconceptions, and plan ahead. In the same fashion as the collaborative zone, the idea is to start out leading students in their discussions before letting them facilitate and share on their own. That’s why it's helpful to define the zone and include the meeting time in your schedule. Living classrooms offer a flexible alternative to traditional classroom setups and enable teachers to educate and engage students in new ways. Despite all the benefits, it can be a daunting task imagining the best approach to convert your traditional, lecture-based space into a more collaborative classroom environment. That’s where the experts at artcobell are most helpful – we can link you in with one of our local partners in your area to walk you through the process, or you can explore more resources we’ve made available for you. What's Next? Learn how to convert your classroom for better collaboration!